This OD Green (Tactical Camouflage Pattern) Infantry Kit includes the Shirt and Pants in OD Green (Olive Drab). It also includes a OD Green (Olive Drab) M1 Steel Helmet and a 1-Hole Balaclava (OD Green). All items are brand new and available in size S-M-L-XL-XXL. In use by Army, Military, Police and Special International Forces. The OD GREEN (Olive Drab) Tactical Camouflage is the most common natural color for concealment and camouflage in Forested & Foliaged environments. Used by military forces throughout history for aesthetic considerations and widely distributed to large conscripted armies during WWI & WWII, the OD Green Camouflage also offers various advantages for warfare and tactical operations. The ability of the OD Green color to blend with natural elements and to limit the perception of specific human body lines and distances make it ideal for military operations. The extensive use of OD Green (Olive Drab) camouflage for Apparels & Gear is also serving a recognition purpose designed for Closer Tactical Range and better adapted to Suburban & Populated Areas. Officially issued to numerous Military Forces, Special Forces, Police Departments, SWAT Tactical Teams and Security Forces around the world since the 1940s. 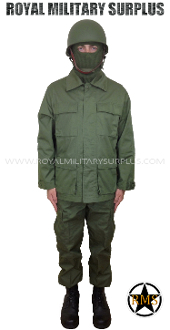 The Canada based Royal Military Surplus online store offers range of quality Military Kits, Combat Uniforms, Tactical Gear and Military Apparel in OD GREEN (Olive Drab) Tactical Camouflage Pattern. You can see the specifications of each individual product by clicking on the links below.